This is one of those meals, yet, I am posting it here because it IS a very complete meal, just not an authentic ramen dish. My 12 year old son has always loved tofu. When he was very young, around 3 or 4 years old, I taught him to cut the tofu because not only has it been important to me that my children know how to cook, but also cutting tofu is such a big task that requires little effort. I cut my tofu in 1/2 inch slices, no thinner and never much thicker. 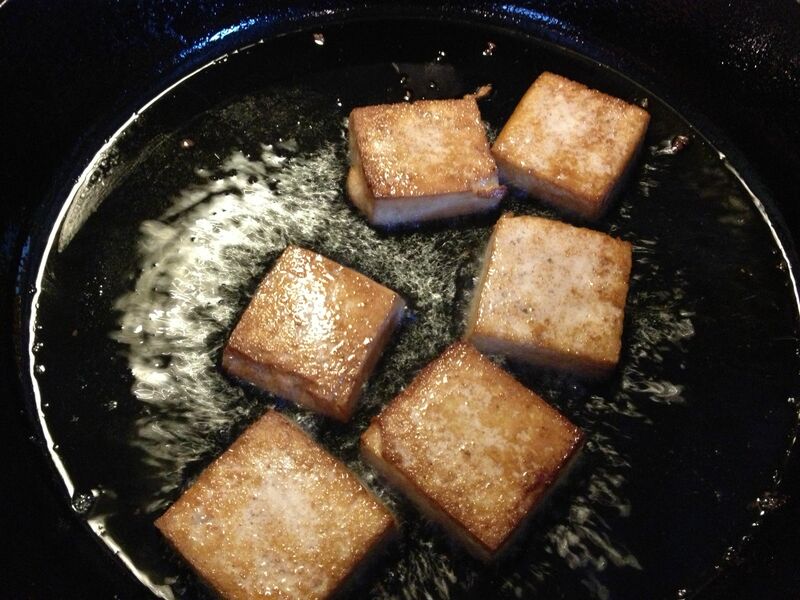 Next I brush a thin coat of soy sauce on each side of the sliced tofu, then fry them in a thin layer of vegetable oil (preferably NOT canola) in a cast iron skillet. Now as I said in so many words previously, when I don’t always have all the ingredients to fulfill a recipe, I start digging through my refrigerator and cabinets and pull out what will suffice. 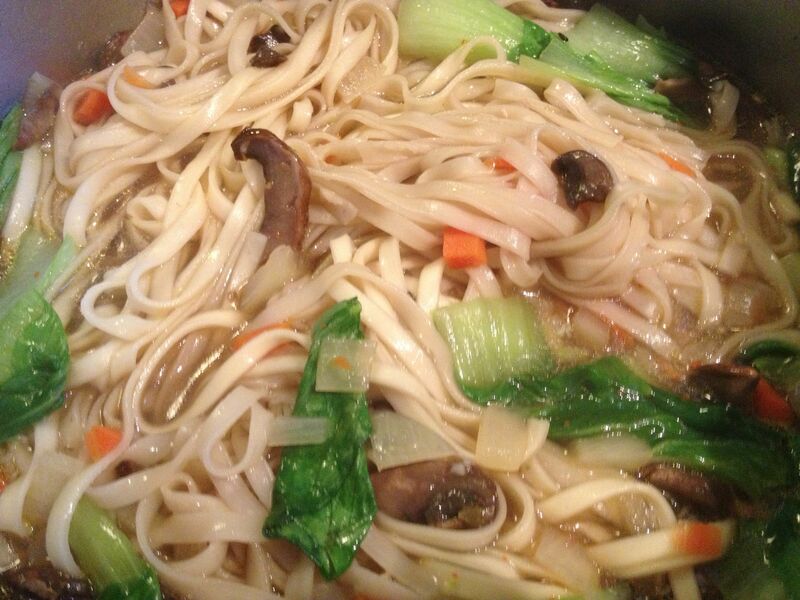 I don’t usually use bouillon and so I rely on sautéed veggie juices for flavor in my broths. This is what I did in this instance. First, I sautéed bite size pieces of carrots and yellow onions until the onions were soft, then added some garlic (to taste) and portabella mushrooms. Next, I added water- probably about 4 cups to start, which I brought to a boil. (The quantity of water depends on first, how much noodles you use and then how brothy you want your final noodles to be.) Finally, I brought the water to a boil, added some egg noodles I got from the Asian Market, let them get somewhat soft (but not done), then added one of my favorite spice blends Nanami Togarashi- assorted chili pepper (which can be found at Asian Markets) as well as fresh bok choy. I add the bok choy last so as not to over cook it, as you do with most greens- kale is an exception. Overcooking bok choy, and any vegetable for that matter, depletes its nutrients and makes it nasty soggy. And another fact I learned is that Parents overcooking vegetables is why most kids despise vegetables. Hmmmm. So I don’t usually mix the tofu into the noodles, although that would be mighty tasty. My son and I, who were eating alone this particular evening, prefer our tofu on the side. Thank you very much. I am really sorry, I don’t have a specific itemized recipe here. My experience in the kitchen has allowed me to gage measurements and know what spices to add per the flavors I want….so if you have any questions, comments, please, I welcome them. 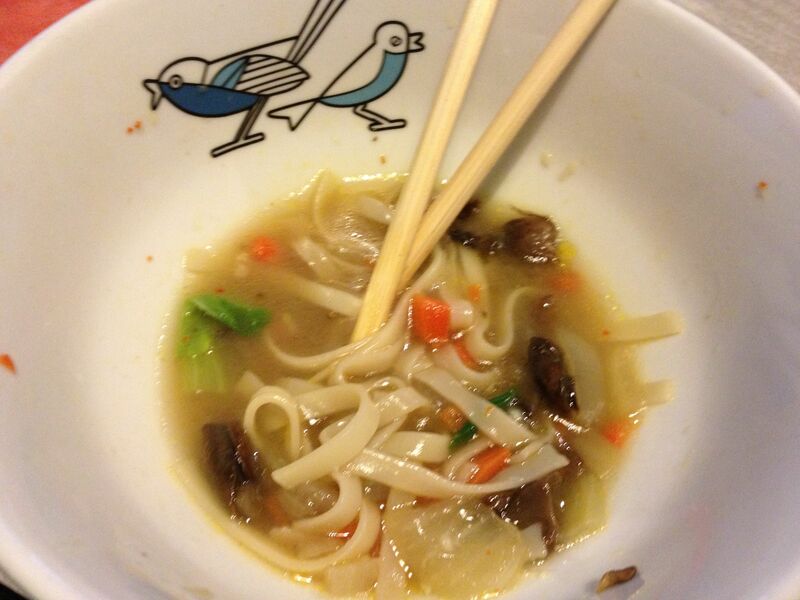 With that, I will make my outro before a half eaten bowl of noodles.